I should get this out before I get pwn3d (just like these guys): today the 23C3 started. Effectively that means a lot of nerds (all kinds) gathering at the Berliner Congress Center near Alexanderplatz, sharing the wonders of nocturnal life and worshipping caffeine. 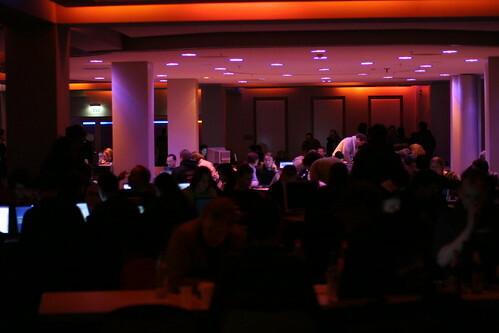 The 23C3 is the 23rd iteration of the Chaos Communication Congress, an annual event organised by the Chaos Computer Club. Quite likely the biggest meetup of the European hacker-scene – not exclusively so though, there’s far too much notworthy international crowd to be listed here. Don’t get me started on the talks and workshops. So, to those that consider themselves technically enthusiastic that aren’t around yet, throw away your shy nature and join us. As you can see, the hackcenter is privacy compatible, and you’re guaranteed no sunlight.